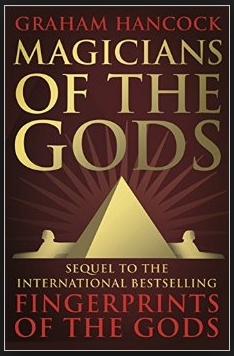 Excited to have received my copy here in the US today of the just-off-the-presses book “Magicians Of The Gods” by my friend, Graham Hancock. I pre-ordered the hardback out of the UK to get it faster and with the British cover (shown above). This is the long-anticipated follow-up to Graham’s world-wide bestseller “Fingerprints Of The Gods,” with all new research and information about humanity’s lost past. In it, he examines the compelling evidence for a devastating comet strike that triggered the great floods of myth, nearly wiping us out as a species and causing the almost instantaneous deep freeze called the Younger Dryas. He also investigates impressive new archeological discoveries like Turkey’s Gobekli Tepe that place (via carbon dating) sophisticated, advanced human societies all the way back at the aftermath of that comet strike, 12,800 years ago, and shows how the survivors of the catastrophe, the Magicians of the Gods, helped restart civilizations all over the world. He also warns of the likely return of massive fragments from the exact same comet that impacted Earth so long ago. It could happen again, and soon. Many works in the realm of ancient civilizations (Atlantis, aliens, etc.) are wild speculations based on flimsy evidence. This is not one of them. Hancock’s work is journalistic (his professional background) and very well-researched, mostly through personal trips all over the world to investigate for himself. The US edition is scheduled to be released on November 10, 2015. My friend, Graham Hancock, is exploring the ancient megalithic site in Turkey called Gobekli Tepe. It dates back an amazing 12,000 years to a time when conventional historians have humans in hunter-gatherer societies. Here in this very large site, we have many huge carved stones weighing 20 tons and more, arranged in numerous great circles similar to Stonehenge but much older, taking history back to the edge of the last ice age and the cometary destruction that likely caused it to end. Graham is writing a sequel to his most popular book, Fingerprints of the Gods, showing new evidence like this site that will shine new light onto our forgotten human heritage from a time before currently accepted history.